It's been rumored for a long time now, but today the news is finally official: Rock Band is coming back. 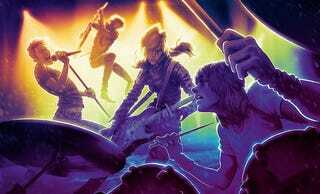 Developer Harmonix is working with hardware manufacturer Mad Catz to bring Rock Band 4 to PlayStation 4 and Xbox One by the end of 2015, the two companies announced today. That's exciting news for plastic instrument aficionados, as is this: Harmonix says their goal is to make the game backwards compatible with every Rock Band guitar and drum set you might have thrown in your basement or garage since the series launched in 2007. They're aiming to let you carry over all of your old DLC songs, too. For more info—and photos of the new instruments—head over to Kotaku UK.